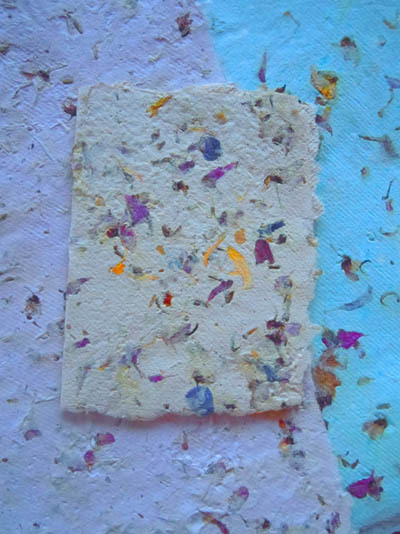 This workshop will introduce you to making paper, using various materials including recycled paper, dried plant materials, flower petals, and scraps of this and that. We will learn about the process of simple paper-making, producing paper that can be used for other art projects such as collage, or simply as an artwork in itself. We will make our own moulds and deckles, the screened frames used to make paper. Using blenders, we will make our paper batches and learn how to include color and other materials to add texture and interest. It’s a slightly messy process, so wear comfortable work clothes. Bring a sack lunch. We will work inside and outside, enjoying the natural panorama of the Sierra Nevada foothills and meadows. Personal checks, MC, VISA and Discover accepted. Fee includes all papermaking materials—frames and screening for making mould and deckle, vat tray, sponge, paper scraps and flower petals. Blender will be provided for use by everyone. You can also bring your own flowers petals, paper scraps and other inclusion materials. A list will be provided upon registration. This entry was posted in art workshops, Elsah Cort, Handmade Papermaking and tagged handmade paper, papermaking on June 24, 2012 by Elsah.